This step is an important one for the success of our project together. We use this to make sure that we've heard what you want and reflected it back properly to you. This proposal will include the type of project, initial measurements, and all of your customizations, along with a fair and accurate price. You'll get the proposal within 24 hours of meeting with us or filling out our online quote form. You can review on your own time, and get back to us when you're ready to get your new project started. 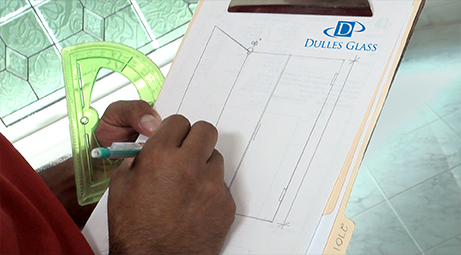 Once approved, we can get schedule the next step in the process: Measurements. After you've approved your quote, we'll make an appointment with you to have a technician come to your house to measure your space. Because we make the glass and mirrors to spec, we'll both want to be confident that you get exactly what you need. All you need to do on that day is sit back and relax as a trained, professional measurement technician takes perfect measurements. This should be the last step in your bathroom remodel, after all the tile is laid, so that you can get accurate measurements for fabricating your shower.